Getting ready for snow removal season? Power through winter weather and keep high-traffic areas such as driveways, parking lots and sidewalks clear by using the right compact snow removal equipment. Whether you plan to rent or buy, choosing the right machine for your weather conditions and work can save valuable time and money. Skid-steer loaders — Designed to turn within their own length, skid-steer loaders have the maneuverability, nimbleness and traction that make them very popular for removing snow in open areas or tight spaces. Unlike a pickup truck with a snow blade, a skid-steer loader can lift and load snow for transport. An enclosed cab with heat, joystick controls and a suspension seat are a few of options that help make your job easier. The optional two-speed transmission also increase efficiency by shortening travel time and increasing plowing performance. All-wheel steer loaders — The all-wheel steer loader is like owning two machines in one. You can quickly change from all-wheel steer mode to skid-steer mode with the flip of a switch. The steerable axles of the all-wheel steer loader increase comfort when riding or turning on hard surfaces and minimize sliding when pushing snow. The all-wheel steer mode also greatly reduces rubber marks left by the tires when turning on concrete. When it comes to pushing snow, your speed improves the blade performance. By using the two-speed transmission, you can choose the high-speed setting to build momentum — resulting in the snow rolling with the blade rather than the blade just pushing it. Mini track loaders — Mini track loaders are easy to operate and economically priced. The walk-behind machine can easily access and clear tight spaces — such as sidewalks and walkways — that are too small for larger equipment. The controls are simple and require little effort to operate. Speed, direction, lift and tilt controls are at the tips of your fingers. Utility vehicles — Two-wheel and four-wheel drive UTVs provide compact solutions for quickly removing light to moderate snow on sidewalks and pathways. They also have the muscle and traction needed for larger snow removal jobs. 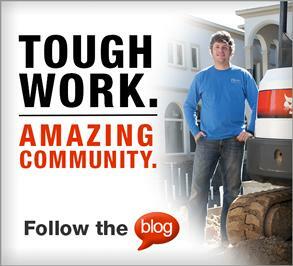 Stay warm while working with an optional enclosed heated cab. Utility work machines — These machines combine the most practical features of a UTV, pickup truck, compact tractor and skid-steer loader into one machine. The four-wheel drive system provides the traction and pushing power needed for fast and efficient snow removal. They have all-wheel steering and a tighter turning radius than most pickup trucks. The machine can travel as fast as 18 mph, which improves plowing capabilities by enabling snow to roll. The enclosed cab — with optional heat — has a suspension seat, easy-to-use controls, cruise control and tilt steering. 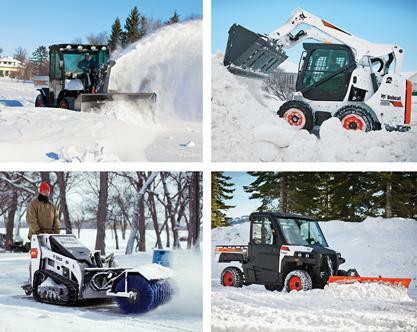 Pair each machine with the right attachments, and you’ll be unstoppable in the snow. Reman parts can offer like-new performance, reliable service life and substantial cost savings to help extend the life of your compact equipment. Two Lift Arm Configurations — Which is Right For You? 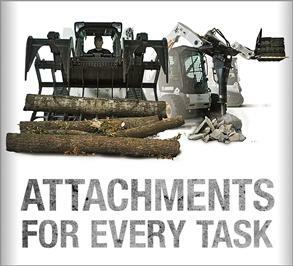 Bobcat Company offers two lift arm styles for its loaders to meet your daily challenges. Compare lift arm designs and choose the configuration that matches your lifting needs. Equipment manufacturers know that when you use your preferred control system and pattern, productivity typically increases and there’s less operator fatigue. For today’s high-performance engines, clean fuel and the right fuel filter help deliver longer component life. What Skid-Steer Loader Tire is Right for the Job? Got a big project coming up? Consider renting. 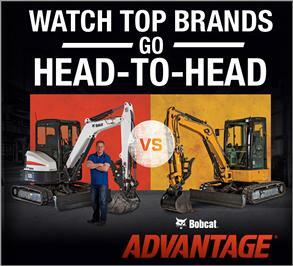 Renting equipment is a smart decision in any economic condition. These tips will help determine if it’s right for you. New solid-mount and optional Roller Suspension™ system undercarriages (available on select Bobcat® compact track loader models) provide significant improvements in six areas. No matter the industry you’re in, a quality compact loader can be one of the smartest investments you’ll make.